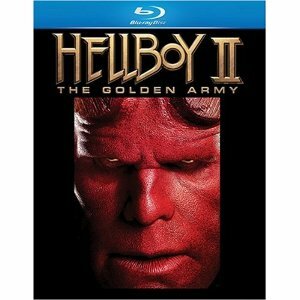 WorldMovieStore - Hellboy II The Golden Army Sinopsis. The feverish Hellboy II: The Golden Army is a very busy sequel that might have looked unhinged in the hands of a less visionary director than Guillermo del Toro. Ron Perlman returns as Hellboy, aka "Red," the Dark Horse Comics demon-hero with roots in the mythical world but personal ties in the human realm. Meanwhile, Red's relationship with girlfriend Liz (Selma Blair), who can burst into flames at will, is going through a rocky stage observed by Red's fishy friend Abe (Doug Jones), himself struck by love in this film. Del Toro's art direction proves masterful, too, in a climactic battle set in a clockworks-like stronghold tucked away in rugged Irish landscape. --Tom Keogh. Read More Sinopsis. 0 Response to "Blu-ray Release Hellboy II The Golden Army"